Whimsical décor and elegant grandeur blend to create luxury accommodations at The Huntington Hotel. 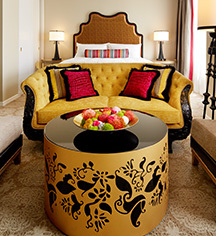 This San Francisco boutique hotel, with Asian-inspired interiors, features fine fabrics, large dramatic headboards, and hand-carved vanities in its 134 guestrooms and suites. Each of the hotel’s three exclusive suites reflects a different nuance: the spirit of Northern California, passion and romance, and Singapore Straits Chinese heritage. Each guestroom, including three exclusive suites, features WiFi, an iPod® docking station, USB ports and electrical charging stations, and work desk. The baths feature hand-carved vanities and lighted mirrors for an upscale feel.